Box zither - Takhe - Site de soundsofangkor ! This duo consists of a zither and a pair of small cymbals. 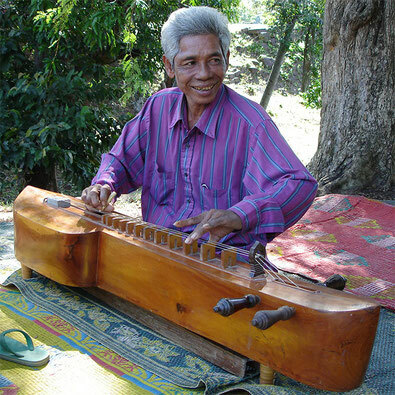 The takhê zither is widespread in Khmer music. Formerly it was shaped like a crocodile and was called kropeu. Its origin is probably Môn. It has three nylon strings strummed with a short plectrum made of bone or ivory; it has twelve frets. Takhê is used in the court orchestras mohori and in wedding ensembles phleng kar. The small bronze cymbals that accompanies the zither, they constitute the essential base of the rhythm in all the Khmer orchestras since at least the 7th c.
Khmer wedding, although simplified and shortened in duration compared to the past, however, retains a certain outfit. He recalls the union of Neak Thong and Preah Neang (the snake girl), a well-known Khmer legend maintaining in rites and musical music until now. Khmer wedding is divided into three phases: preliminary to marriage, marriage itself and after marriage. All preliminaries are orchestrated, in the tradition, by a matchmaker conducted by the boy's family. The musicians are actors dedicated to entertainment. Their work begins with the ritual procession organized in the cities, between a place in a few hundreds of meters from the house of the girl. Before the starting of the procession, two musicians hit two flat gongs (khmuh) that punctuate also later all the key moments of the wedding. The actual wedding takes place in the home of the girl in the presence of close family and masters of ceremonies. The orchestra plays all day almost unabated. The wedding orchestra here takes a minimalist configuration: drum (skor daey), two string fiddle (tro), box zither (takhe), table zither (khoem) — not played here — and a singer. Beyond the purely musical aspect, we can see here different elements constituting the marriage ritual. Parents attach red cotton around the wrists of married. Red is the lucky color for weddings. Then, in the hands of the bride, US $ 100, immediate family donation. In turn, the close family attaches red cotton too and donates. Married are blessed with holy water (Buddhist ritual). A master of ceremonies prepares areca flowers, essential offering for Khmer wedding. Three popils with their candle are nineteen times round a group of five men and four women arranged in a circle around the couple. Everyone in passing smoke fall back to itself with the free hand in a sign of purification. This sequence was shot in December 2011 in Kampong Cham.